Last we checked in on the St. Louis Blues, they were careening toward rock bottom in the Western Conference. Their defense and goaltending were a hot mess, and replacing their head coach hadn’t appeared to solve any issues. Since that rocky start, however, they’ve produced a 12-7-1 run that has propelled them right back into the playoff conversation. Granted, a few teams hitting a wall hasn’t hurt their cause. At any rate, Craig Berube’s club is now performing to its potential. Over the past 20 games, St. Louis is averaging 2.90 goals scored and 2.30 goals against. It won’t overwhelm its opponents with offense, but it’s giving them all kinds of trouble in close contests by presenting a united front and controlling 55.7% of the shot attempts at 5-on-5. There’s reason — or many reasons — to believe the Blues can ride this momentum into the postseason. Sniper Vladimir Tarasenko has found his rhythm, whereas the team’s play on the blue line and between the pipes has improved by leaps and bounds. Goaltender Jordan Binnington (1.88 GAA, 92.1 SV%) has rightfully earned praise for his showings. The 25-year-old rookie combines solid positioning and athleticism, instilling a sense of calm on the back end. Though it’s too soon to tell if he’s the real deal, there’s no denying his impact on this season’s Blues. Prior to his first start on Jan. 7, St. Louis’ GAA was an unsightly 3.31. Since then, St. Louis is allowing 2.00 goals per game. It’s no happy coincidence that the team’s possession numbers have perked up (50.0 CF% to 54.2 CF%) as well. There’s nothing more unsettling than playing in front of a jittery netminder. Any slip-up can end up in the back of your net, so players resort to making hyper-conservative decisions. If we don’t take any chances, they won’t get any either…right? Well, not quite. Over time, repeatedly conceding possession will only hamstring your own offense and tilt the ice in the opposition’s favor. And that will inevitably come back to bite you. It did early on. Often. Jake Allen (3.04 GAA, 89.7 SV%) and Chad Johnson’s (3.55 GAA, 88.4 SV%) stat lines are a reflection of both their poor outings and the club’s once-panicky puck management. Thankfully, St. Louis is an entirely different and more confident squad with Binnington in the crease. It’s unclear how ready he is for this role — starting goaltenders in St. Louis have been much-maligned for years — but he’ll hold it until his performance suggests he no longer should. The blue line has also been bolstered by captain Alex Pietrangelo’s return from hand surgery. Much like his teammates, he didn’t look right to start the season. 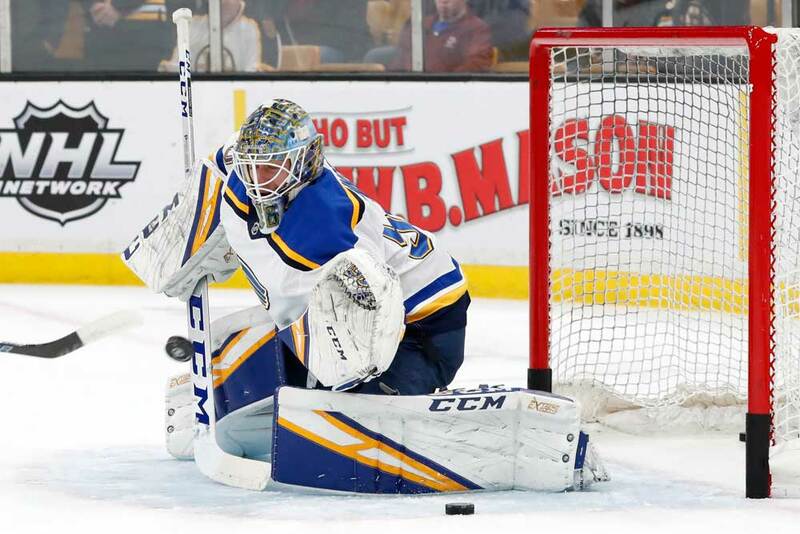 And much like his teammates again, he’s certainly turned things around with Binnington as the starter (13 points in 28 games, -8 vs. 7 points in 12 games, +4). He brings poise, smarts and quiet puck skills to a squad that was frequently out of sorts early in 2018-19. Up front, Ryan O’Reilly (53 points in 51 games) is the constant at the heart of this resurgence. With St. Louis’ campaign hovering near the gutter, the 27-year-old center refused to quit on his new team, putting forth strong two-way displays to keep its head just enough above water to survive. In order to prevent this season from falling apart at the seams, he’s offered St. Louis the finest year of his career. He’s enjoying his first point-per-game campaign while maintaining a steadfast commitment to defense. You’d be hard-pressed to find a forward who’s delivered more three-zone value in 2018-19. Whether or not the Blues are on their game, O’Reilly nearly always is. He also provides St. Louis with a true difference-maker outside of Tarasenko. He can make something out of nothing rather than settling for what opponents grant him. Though he possesses a solid skill set, his most important trait is his hockey sense. He processes the game quickly and understands when as well as where he should attack. To complement his awareness, he brings a whatever-it-takes mentality to the table. If finesse isn’t cutting it on any particular night, he’s perfectly fine with flooding the dirty areas and digging for rebound opportunities. Better still, he’s reached new heights offensively without compromising his superb defense. Elite two-way centers are often thought of as hard-nosed, but O’Reilly is actually silky-smooth in his approach. He devotes his efforts to maintaining inside leverage and using his active stick to disrupt the opposition. And he’s really, really good at it. When you consider his deployment and quality of competition, a GA60 of 1.95 is spectacular. Thanks to his textbook positioning, he doesn’t need to scream up and down the ice or lay out for a desperation block. It all seems effortless. Of course, it takes great dedication and focus to make it look that easy. Viewed as a whole, his contributions are tremendous. He comfortably outpaces his team in shot, scoring chance and goal shares. St. Louis’ GF% with O’Reilly on the ice is a sparkling 62.5. Moreover, his relative GF% ranks 11th among forwards with at least 500 even-strength minutes played. On top of that, he’s leaned on heavily (20:48 TOI) and wins 57.7% of his draws. He continues to improve as a player and lead by example — and some of the other Blues feel compelled to follow it. While he’s been sidelined since Jan. 17 with an upper-body injury, David Perron has 24 points in his last 24 games. The crafty winger has emerged as a key source of offense in his third stint with the team and should return shortly. Meanwhile, Tarasenko has rebounded from a dreadful start to the season. He has 14 points in his last 13 contests and has developed a fair bit of chemistry with O’Reilly. This type of production in the heat of a playoff race should put a damper on trade rumors. Veterans can lose their fire over an extended rough patch. However, watching newcomers step in and carry the torch is bound to ignite their pride as professional athletes. You can’t sit back and watch them do all the heavy lifting. Therefore, a few key cogs have dusted off the cobwebs and joined O’Reilly and Binnington in hopes of changing —and perhaps lengthening — this season’s narrative. As it stands, the Blues rank 10th in CF%, 11th in SCF% and 13th in GF%. They sit just one point outside the playoff bubble. With 31 games left and a groundswell of momentum behind them, there’s ample time to climb even further up the ladder.